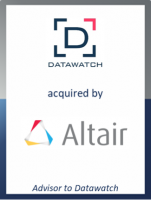 GCA acted as exclusive financial advisor to Datawatch (NASDAQ: DWCH), a leading data intelligence software company, on its sale to Altair (NASDAQ: ALTR). Altair has agreed to acquire Datawatch for $13.10 per share in cash, a 35% premium to the closing price of Datawatch’s common stock on November 2, 2018, or approximately $176 million. Datawatch offers market-leading enterprise data preparation, predictive analytics and visualisation solutions to businesses around the world. Its products are used in more than 100 countries by thousands of organisations, including 93 of the Fortune 100. Altair assists its customers in the design and decision-making processes by applying simulation, machine learning and optimisation to product lifecycles. The company serves more than 5,000 customers across broad industry segments from its 71 offices in 24 countries. The combination of Datawatch and Altair results in a powerful offering that synergises simulation, data science and machine learning technology. The acquisition will enable Altair to cross-sell Datawatch’s best-in-class data management and analytics solutions into its industrial and manufacturing customer base, using Altair’s proven subscription-based licensing model. There is also a meaningful opportunity to add value to Datawatch’s core customer segments, especially in financial services, by bringing relevant Altair products into these markets.